Situated around 50 km north of Panaji, Arambol a small remote fishing village has one of the most charming beaches of Goa. The place has two beaches, more popular is the main beach (Harmal beach), the northernmost beach in Goa. Every tourists dream, the beautiful beach is secluded and has a primitive, untouched feel to it. The second, more picturesque beach lies beyond the rocky headband and can only be reached on foot and is bordered by steep cliffs on both sides. The main beach, on a long stretch of curving sand is good for swimming. It is a place ideal for people looking for peace and tranquility. A hot spring near the main beach which feeds into a freshwater lake, producing silt on the lakeshore said to be good for the skin, that some are fond of smearing on their bodies. On its immediate north there are several attractive, relatively quite bays and fresh water pools also good for swimming separated by rocky headlands. The headlands are made of basalt and are clearly visible for miles along the coast. A well made track runs round the headland to the second beach which is even more secluded and little used. The coastal path again continues round the next headland to the Terekhol beach, the northernmost tip of Goa on the Maharashtra border. Arambol village is quiet and friendly, with just a few hundred locals mostly fishing people. The place is ideally peaceful allowing you to have a close experience of local life and culture. 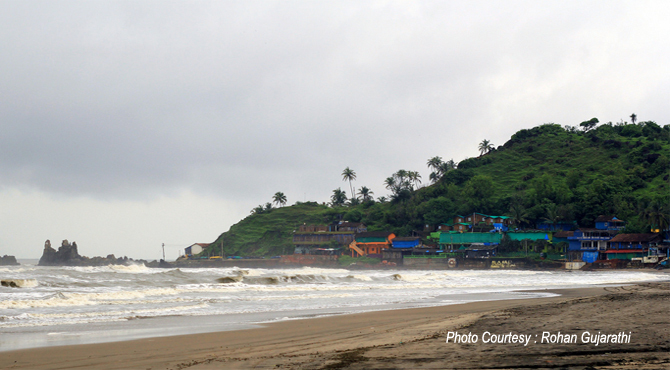 The relaxed environment coupled with peace and tranquility attracts many vacationers from other beaches of Goa. The Harmal beach is 2.5 km from the village bus stop, down a road passing village houses sheltered under coconut trees. The rocky headland or the cliffs near the beaches are popular for paragliding. Dolphin watching boat trips and paragliding are amongst the fun activities on this beach. Boat trip to Anjuna beach are also available. A few shops sell clothes, junk jewelry and handicrafts from across Goa and India. Some good cafes along the main beach and on the headland to the north serve up tasty dishes from the cuisine of Italy, Goa and India.